The current media scenario, marked by technological and narrative changes, requires journalists to constantly bring themselves up to date in order to maintain the connection with their audience. This article presents transmedia storytelling as the best ally of journalism for the dissemination of facts. This communicative model grants a nature of expansion, multiplicity and depth to the stories, which allows to raise the level of participation of the public in each medium in which information is developed. Specifically, this research seeks to detect the ways in which journalism can use transmedia narrative to reach and generate interaction in the millennial generation. 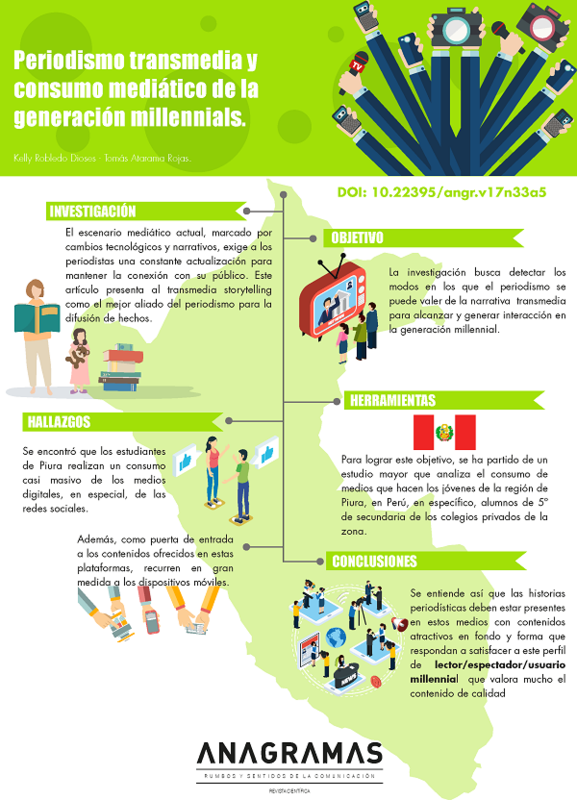 To achieve this goal, a larger study that analyzes the consumption of resources made by young people in the region of Piura, in Peru, specifically, students in 5th year of secondary school in private schools in the area, was taken as a starting point. Thanks to the study, it was found that Piura students consume high, almost massive, amounts of digital media, especially social networks. In addition, they rely heavily on mobile devices as a gateway to the content offered on these platforms. Thus, news stories must be present in these media with attractive content in substance and form, that can satisfy this reader / viewer / millennial user who highly values quality content. Arriagada, A. y Schuster, M. (2008). Consumo de medios y participación ciudadana de los jóvenes chilenos. Cuadernos de Información, 22, 34-41. Bringas, C., Rodríguez, F., y Herrero, F. (2008). Adaptación y motivación escolar: análisis de la influencia del consumo de medios electrónicos de comunicación por adolescentes. Cuadernos de Trabajo Social, 21, 141-153. Darío, R., y Astudillo, F. (2005). Periodismo por dentro. Una pausa en medio del vértigo. Quito: Quipus, CIESPAL. Elan, C., Stratton, T., y Gibson, D. (2007). Welcoming a New Generation to College: The Millennial Students. Journal of College Admission, 195, 20-25. Gfk Perú. (2015). Uso de internet en el Perú. Lima: Gfk Conecta SAC. Instituto Nacional de Estadística e Informática. (2014). Estado de la niñez y adolescencia (Informe Técnico N.° 2, junio 2014). Lima: INEI. Kovach, B. y Rosenstiel, T. (2012). Los elementos del periodismo. (A. Diéguez R., Trad.). Madrid: Aguilar. Lasswell, H. D. (1927). Propaganda technique in the world war. Londres: Paul. López, D. (2003). El consumo crítico de los medios de la juventud y el lenguaje de la discreción como propuesta pedagógica. Palabra Clave, (9), 2-16. Neuman, W. R. y Guggenheim, L. (2011). The evolution of media effects theory: A six-stage model of cumulative research. Communication Theory, 21(2), 169-196. Orihuela, J. (2011). 80 claves sobre el futuro del periodismo. Madrid, España: Anaya. Porto, D. y Flores, J. (2012). Periodismo transmedia. Madrid: Fragua. Raines, C. (2003). Managing millennials. Connecting generations: The sourcebook for a new workplace. Seattle: Crisp Publications. Scolari, C. (2013). Narrativas transmedia: cuando todos los medios cuentan. Barcelona: Deusto.